One of Hollywood’s most potent power couples is back. Ridley Scott and Russell Crowe team up again with an origin story of the legendary hero who stole from the rich and gave to the poor in Robin Hood. The film opens in epic fashion with a well-executed action set piece as King Richard the Lionheart and his men, including Robin and Little John, lay siege to a castle in France. Robin and his fellow archers, soon to be Merry Men, battle valiantly, and victory is theirs. Despite the victory, all is not well. England’s warring ways have left the country nearly bankrupt, and rampant taxation to fund Richard’s battles have left many in a more than compromising position. Robin finds destiny thrust upon him and finds himself fighting to empower the people being gouged by the throne’s taxation and corruption. Russell Crowe gives us a version of Robin that not too surprisingly is reminiscent of his turn in Gladiator. Crowe’s version is tough as nails, a brutal warrior, and deadly with a longbow. Crowe’s Robin would likely knock the stuffing out of Kevin Costner’s version in a heartbeat. Crowe marries this innate toughness with levity (dare I say ‘merriness’) that softens Robin a touch. 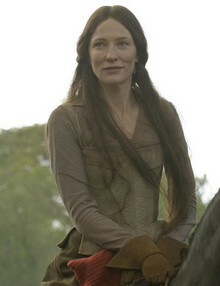 Crowe’s solid performance is complemented nicely by Cate Blanchett’s turn as Marion. Marion is a feisty and sharp tongued independent woman who won’t stand for the corruption and taxation that has placed her family and fellow denizens of Nottingham in dire straits. Robin is a powerful presence, but equally matched by the passionate Marion. Some of the best scenes in Robin Hood involve banter between the two. Equally pleasing are the myriad battle scenes sprinkled throughout Robin Hood. As director, Ridley Scott does a masterful job creating action set pieces that feel authentic, brutal, and visceral. War is hell, but in this film it is particularly hellacious. The relative lack of special effects/CGI lends even more authenticity to these powerful scenes. Where Scott, and perhaps screenwriter Brian Helgeland, falls a bit short is in the unfolding of the story. 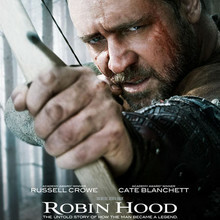 The story of how Robin Hood becomes Robin Hood is intriguing and at times compelling, but there is arguably too much going on during in this film for one to easily keep all the threads together. The abundance of subtitles indicating various locations/times serves to confuse and distract rather than enlighten. The glut of story threads to manage during the course of the film makes Robin Hood feel a bit unfocused. This is a film that could have been two film, and actually might have made for two great films. Instead, what we’re left with in Robin Hood is merely a decent film that has moments of brilliance, but far too many moments of mediocrity. If you ask a bit more of your average summer blockbuster, you may find yourself a bit disappointed.